The Council is seeking a Grounds Manager to manage the landholding assets of the Council. Please see the Jobs tab or follow the link to http://bramshottandliphook-pc.gov.uk/jobs for more information. The Council is seeking an Administration Officer to provide support services for the Bramshott and Liphook Neighbourhood Development Plan. The LMC Management Committee meeting scheduled for 21st March 2019 has been cancelled. Due to the number of apologies that have been received for the LMC Management Committee meeting scheduled for 17th January 2019, the meeting will be inquorate. As such, this meeting will not be held. The Parish Office will be closed for Christmas from Monday 24th December to Tuesday 1st January inclusive. We will reopen on Wednesday 2nd January 2019 at 10am. The Council are looking to Co-Opt a councillor to fill the final vacancy. Please see the notice below. The council is inviting groups and organisations to apply for grant funding in 2019/20. The grant aid policy and application form are available below or from the Parish Office. Letter regarding cancellation of carol singing in The Square this year. The council are looking to recruit a Property Manager. Please see the job advert in the jobs tab on this website. The Finance and Policy Meeting scheduled for this evening has been rearranged for next Tuesday, 17th July. As part of the programme of works being undertaken by Operation Resilience Hampshire Highways will be undertaking drainage civil works on Tunbridge Lane and Church lane junction, Bramshott. The works are programmed to start 2nd July 2018 and are expected to last for 3 weeks during which time the road will be closed to vehicular traffic. The carriageway resurfacing works will follow completion of the drainage works & will last for 2 days from the 26th July, during which time the road will be closed to vehicular traffic. Access will still be made available to residents when safe to do so. Information boards advising road users of the works will be erected on site and letters will be sent to local residents and businesses. An email will be sent to East Hants District Council and Liphook & Bramshott Parish Council to advise them accordingly. Living in Liphook and looking for a part time job that is interesting, varied and satisfying? Liphook Parish Council seeks a Caretaker for its busy and exciting Millennium Centre. The job will involve working between 15 and 20 hours a week, worked flexibly to suit hall bookings, and will include occasional evenings and weekends. Training is available. A chance to get involved with your community and to make a difference. Bramshott and Liphook Parish Council and Liphook in Bloom, assisted by Liphook Rocks and the Scouts and Guides Association, invite you to join us on our Litter Picking Day on Sunday March 25th, meeting at Midhurst Road car park at 9.30am. Bags and sticks provided, bring your own gloves. what goes on in your community? The Parish Office will be closed on Friday 2nd March due to staff not being able to drive to the village safely. Apologies for any inconvenience and normal service should resume on Monday 5th March. The Parish Council Meeting of 26th February which was postponed due to a power cut will now be held on Wednesday 7th March 2018 in the Canada Room of the Millennium Hall. Would you like the chance to use your organisational and administration skills to support your local Parish? Are you looking for a role which allows you to work flexibly? 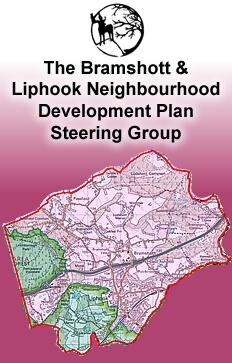 Does the idea of being part of the process to “deliver a Neighbourhood Development Plan to enhance the Parish of Bramshott and Liphook, both now and into the future” sound exciting? We are seeking a NDP Administration Officer to provide administrative support services, including acting as the main administrative officer and contact for the Bramshott and Liphook Neighbourhood Development Plan (NDP). Please see the Jobs tab or follow the link to http://bramshottandliphook-pc.gov.uk/jobs for more information and details of how to apply. The vacancy caused by the resignation of Cllr Berry is to be filled by Co-option. Please see the notice below. The council has a vacancy for an administrative assistant to work at both the Haskell Centre and the Liphook Millennium Centre. Up to 26 hours per week. Please see the jobs tab for more information and a recruitment pack. Closing date 15th September 2017. Agenda for the Parish Council Meeting on 24th July 2017. Reporting to the Executive Officer and responsible for day to day operation of the council. You may work in the sector or seek a change in direction. The job involves managing a team of staff, office management, finance, & property management. Up to 37 hpw Monday – Friday including up to 2 evening meetings per month. Starting Salary £25-£28,000 p.a. depending on experience and qualifications plus Membership of the Local Government Pension Scheme. Closing date 25th July 2017. Please see the jobs tab for further information and an application form. Notification from South East Water concerning maintenance works in Liphook. The council are looking to recruit a locum Executive Officer to cover the one year Sabbatical of the Existing Executive Officer commencing 1st October 2017. See the jobs tab for more details. We have been engaged in talks with an engineering consultancy firm as it is a more complex project than just ‘replacing the bridge’. We require approval from various different agencies, planning permission and more. We are, however, proceeding well but it will take longer than we had originally anticipated. We are sorry that there is no bridge for ‘Pooh Sticks’ and the ‘Dog and Duck Race’ this year. Please find the link below to the consultation document on the East Hants Website. Following an inspection of the wooden bridge in Radford Park it has had to be closed to public use. The bridge was constructed over 30 years ago by a team which included one of our current ground staff. It is made entirely of wood and sadly, over the years the wooden struts and supports have started to rot rendering it unsafe to use. The Parish Council is looking to replace the bridge and is currently exploring various options. The Parish Council will keep you up to date with proceedings. Minutes of the LMC Committee Meeting – 17th November 2016. Consultation on 30 MPH Speed Limit in Longmoor Road. You can download an application form and Policy document here. Letter from the Canadian High Commissioner concerning donations to the Canadian Red Cross Alberta Fires appeal. Tree maintenance in Radford Park will be starting on Monday 5th September and continue for 3 weeks . Please be careful when walking in the park. Notice of Conclusion of Audit – Below is the statutory notice together with Sections 1 to 3 of the Annual Return. The full Annual Return can be found in the Publication Scheme-class 2 of this website. Minutes of the Liphook Millennium Centre Committee Meeting on 21st July 2016. Letter of thanks from the Canadian High Commissioner to all who have contributed to the Red Cross for the Fort Murray Fire Appeal. There is a vacancy following the resignation of Councillor Maroney. Please see the statutory notice below. Co-option of a Councillor – the council is to fill the casual vacancy caused by the resignation of Cllr Hooper by co-option. Please see the attached notice. The is a councillor vacancy following the resignation of Councillor Hooper. Please see the statutory Notice. ADMINISTRATOR for Liphook Millennium Centre – for details see ‘Jobs’ page. Your chance to have your say in the choice of tree that goes into The Square. Choose from Caucasian Lime, Native Hornbeam, Tulip Tree or Sweet Chestnut. You can vote in person by visiting the Parish Office or the Millennium Hall, by telephone on 722988 or by emailing council@bramshottandliphook-pc.gov.uk Voting closes on the 31st March 2016. Please see attachment below for information about each tree. The work is to repair a broken sewer & final re-instatement of the road. A letter received from SE Water. Please see letters on this matter. Requests should be received by 30th November 2015. The grants policy and application form are available below. A meeting is being held on Monday 14th September at 8.00 pm at the Liphook Millennium Centre. A roadshow is being held on Monday 14th September between 3.00 pm and 8.00 pm at Greatham Village Hall. Latest Internal Audit Report for 2014-15 and action plan. Future Meeting Dates May 2015 to May 2016.